Make yourself at home in one of the 128 air-conditioned rooms featuring flat-screen televisions. Wired and wireless Internet access is complimentary, while video-game consoles and cable programming provide entertainment. Private bathrooms with shower/tub combinations feature complimentary toiletries and hair dryers. Conveniences include desks and coffee/tea makers, and housekeeping is provided daily. 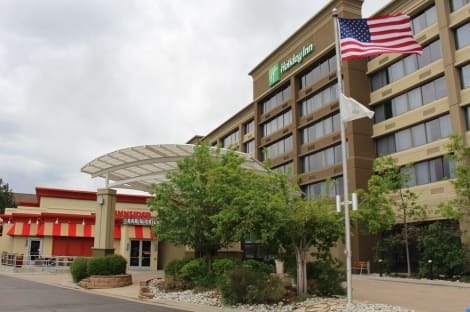 Located in Lakewood, Courtyard by Marriott Denver Southwest-Lakewood is in the business district, within a 15-minute drive of Bandimere Speedway and Lakewood Cultural Center. This hotel is 7.7 mi (12.4 km) from University of Denver and 10.2 mi (16.3 km) from Denver Tech Center. Located in Lakewood, Extended Stay America Denver - Lakewood South is within a 15-minute drive of Bandimere Speedway and Denver Federal Center. This hotel is 8.2 mi (13.2 km) from University of Denver and 10.5 mi (16.9 km) from Red Rocks Amphitheater. Enjoy recreational amenities such as an indoor pool and a 24-hour fitness center. This aparthotel also features complimentary wireless Internet access, concierge services, and gift shops/newsstands. With a stay at Comfort Suites Lakewood - Denver, you'll be centrally located in Lakewood, within a 15-minute drive of Bandimere Speedway and Denver Federal Center. This hotel is 8.4 mi (13.4 km) from University of Denver and 10.6 mi (17.1 km) from Red Rocks Amphitheater. lastminute.com has a fantastic range of hotels in Lakewood, with everything from cheap hotels to luxurious five star accommodation available. We like to live up to our last minute name so remember you can book any one of our excellent Lakewood hotels up until midnight and stay the same night.